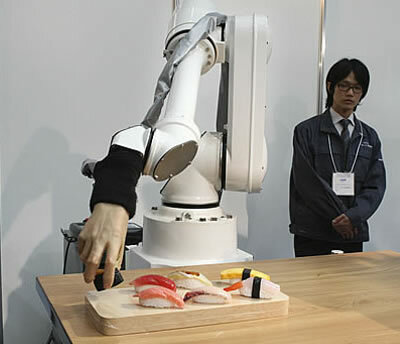 The sushi robot, called Chef Robot model M-430iA hand type H, cannot actually make sushi; there are automated sushi making robotic systems that can produce hundreds of sushi rolls per hour. It can, however, place your sushi on your plate with inhuman precision and delicacy. Japanese roboticist Masahiro Mori remarked in 1970 that, as robots become more humanlike in appearance, people will respond more positively. However, he posited that a point will be reached where people will be strongly repulsed - the "uncanny valley". Take a look at the following video to see just how deep the rift can be; start at about 3' 40". I think that my experience with a video from an exhibition by Korean artist of robotically controlled actual cow tongues may have prejudiced me against the sushi robot shown above. However, it is a curious thing that the video of a robotically-controlled human hand is more repulsive to me than, for example, the robotic endoskeleton of the terminators in Terminator Salvation (the most recent example). From a variety of sources, including Gizmodo.